Barbara Muir Paints: Give me more colour please! to reveal surprisingly bright colours and that's not all. actually often admiring is centuries of dirt. Labels: colour and tradition. to each her own. Siena Duomo. Maybe the artist(who made the comment)was afraid of vibrant colour-with its power and strength and didn't know how to use it at it's full glory.He had the problem not you.Keep with the colours and the power. After a deep psychological gulp, I did not take the comment to heart. It was not a guy by the way. And in fact I think by the end of the talk we were in synch, but the Siena cathedral made me remember the comment and reflect on how the world views art. I can't tell you how much I wish I could walk out my door and see it again right now. Thanks for the vote of confidence, but of course we're in the same camp. You are a complete sweetheart. No it wasn't a guy, and it would have been considered very bad form to do any throwing. No I just took a breath and moved on. I don't intend to change my colour, although I am thinking of different colours all the time now -- inspired by Florence. There was a lot of talk about whether or not I modulate my colours. I do of course, but only to make them richer in most cases. I 100% thank you more than I can ever express for your support. I must say you are wonderful. 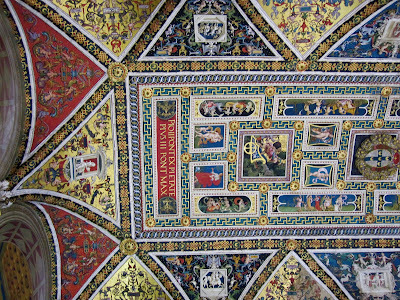 What I really meant to say, and probably said it wrong, is that the talk set off a small parade of thoughts in my head, culminating in seeing the beautiful room in Siena. Things are very different in my part of the art park. We are just painting. Sure there's theory, but it's way in the background, what I am doing is throwing around every ounce of joy I can muster. I think for people who believe you have to talk about the serious aspects of life in your art, like war, poverty and hunger -- this may seem frivolous. I think that's a valid thought, but for me, joy is the most serious goal -- and often it takes two or three tries to get to joy -- to find the up side in a situation. That is my serious message. Be happy. That's it. You are the best. I hope you are entirely well. Love the portraits. Have a Merry Christmas. Oh no! Your vivid palette is so gorgeous and such a signature of your style. Thanks for all of your Italian posts. They were so interesting and the photos were great. It's going to be nice to have you back home and painting! I've missed seeing your gorgeous work! You are sweet. I've missed having access to the internet so I could see my friends' work. I love your work. I don't know how much painting I'll get done in the next week, but I'll start in earnest as soon as the Christmas wrapping is cleaned up. Meanwhile I think I'll just keep talking about Florence. It was a huge event in my life. I am glad you were able to take a deep breath and not allow this criticism to affect you in a negative way. The colours and style in which you paint is entirely unique. I believe you have accomplished what many artists strive for and that is to have a recognizable style. I would be able to walk into a room full of various artists work and spot yours and know it was Barbara Muir who painted it. And that is 100% due to your vivid, vibrant colours that radiate joy and life and love. Some of our first interactions with each other were of you offering insight and kindness when I blogged about criticism I had received, so I know that you know it really is not important what others say and often there can be jealousy lurking behind these comments. I am so happy for you that you experienced Florence. I was there almost 20 years ago (ack! )and after seeing your photos would love to go back. It was one of my favorite cities in Europe. I love your colour, I love your paintings, I love your philosophy and I love YOU!